Bird cherry oat aphids are small (2mm) olive-green aphids with a red-orange patch surrounding the base of each cornicle (Figure 1). Old, wingless, overwintering adult aphids are darker, almost black. At this time, you may also find winged aphids that have moved in to the field (Figure 2). What are my suggestions regarding control of bird cherry oat aphid in winter wheat? Unpublished research provided by Dr. Kris Giles (OSU) and Dr. 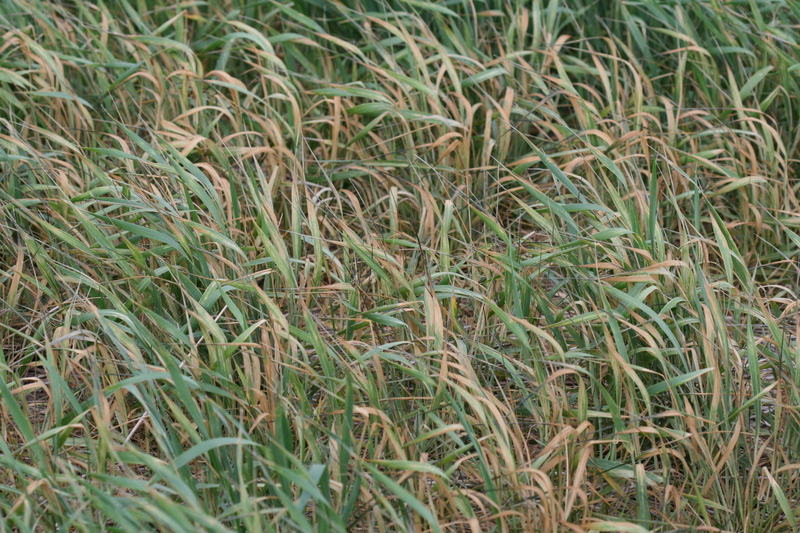 Norm Elliott (USDA-ARS) along with studies conducted in South Dakota, Minnesota, and North Dakota on spring wheat indicated that BCOA causes yield loss before wheat reaches the boot stage. Approximately 5-9% yield loss occurs when there are 20-40 BCOA per tiller (average 7%). Visible damage from bird cherry-oat aphid is not very noticeable so infestations may go unnoticed. It is very important to check fields for infestations and make treatment decisions only after a field has been checked. 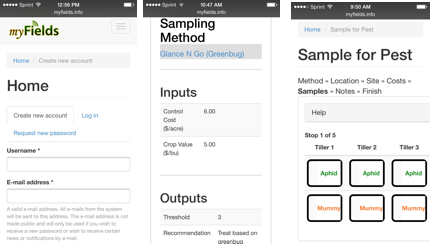 If greenbugs and bird cherry oat aphids are both present, use Glance n’ Go to scout, which can be accessed at http://entoplp.okstate.edu/gbweb/index3.htm. Published research from Giles and Elliott showed that Glance n’ Go sampling will work with both aphids if they are both present. If bird cherry-oat aphid is present alone, count the number of aphids present on each of 25 randomly-selected tillers across a zigzag transect of the field. The reason that you can’t use Glance n’ Go is that the most available research suggests that the threshold is too high to effectively use Glance n’ Go. Look for evidence of parasite activity in the form of mummies (Figure 3). 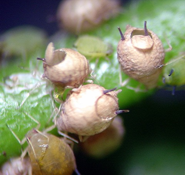 A rule of thumb is that if 5-10% of the aphids are mummies, more than 90% are already parasitized. If mummies are not present, use the guidelines below to make a treatment decision. If, after thoroughly scouting your field, you can identify that infestations are spotty, consider spot spraying with a ground rig. Use the YIELD LOSS TABLE to determine a potential YIELD LOSS from the aphids. Then estimate your CROP VALUE and calculate your CONTROL COSTS. Use those numbers to estimate PREVENTABLE LOSS. If estimated PREVENTABLE LOSS is greater than CONTROL COSTS, Treat; otherwise, Don’t Treat. Check CR-7194, “Management of Insect and Mite Pests in Small Grains” for registered insecticides, application rates, and grazing/harvest waiting periods. 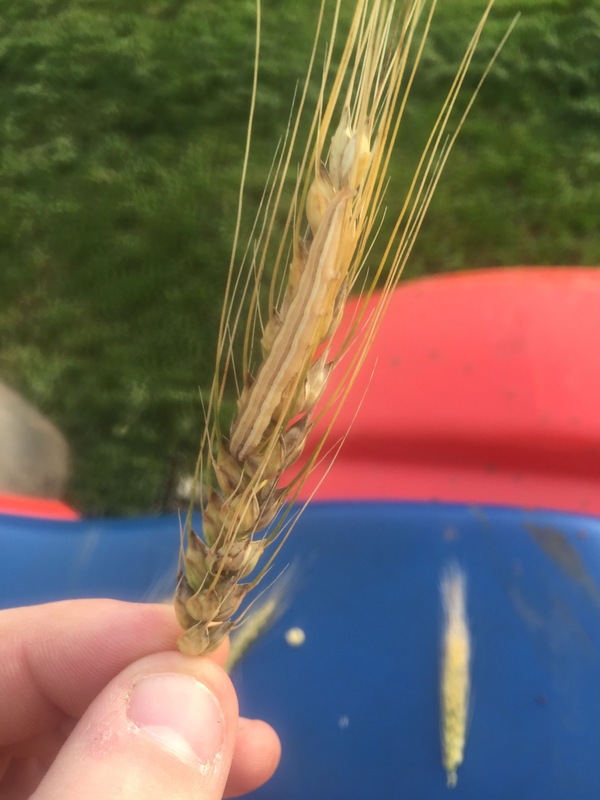 Heath Sanders, Canola Field Specialist with Great Plains Canola, was scouting some wheat fields for armyworms in southern Oklahoma this past week and sent us some photos of damaged wheat heads that were being fed upon by wheat head armyworm. He stated that he had a hard time finding the worms because they blended in so well with the color of the wheat. The insect causing the damage was Faronta diffusa, known as the wheat head armyworm. Unlike the armyworm, which was discussed last week, the wheat head armyworm is very capable of damaging wheat kernels. Adult moths lay eggs on plants in the spring, and the larva feed directly on the grain heads, mostly at night. The caterpillars range in color from gray to greenish with distinct yellow, white and brown stripes going lengthwise across the body. They typically have a larger head relative to their body. Because the larvae are so variable in color, the best way to identify them is to send in a sample to the Plant Disease and Insect Diagnostic Lab. Fields can be scouted with a sweep net to determine numbers of caterpillars. There is no established treatment threshold because it rarely causes economic damage and more often than not the damage is not noticed until the grain is harvested. 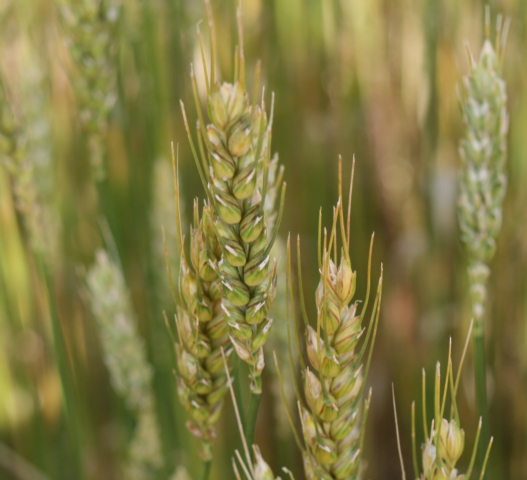 If wheat is at soft dough, consider treating the field to reduce damage. This insect is often found along the margins of fields so if scouting shows that they are restricted to the field edges, consider spraying the field margins with a border spray. Pay careful attention to pre-harvest intervals when selecting an insecticide. This insect rarely causes significant damage. The major issue with wheat head armyworm damage has to do with the grain grading which is classified as IDK (Insect Damaged Kernels). 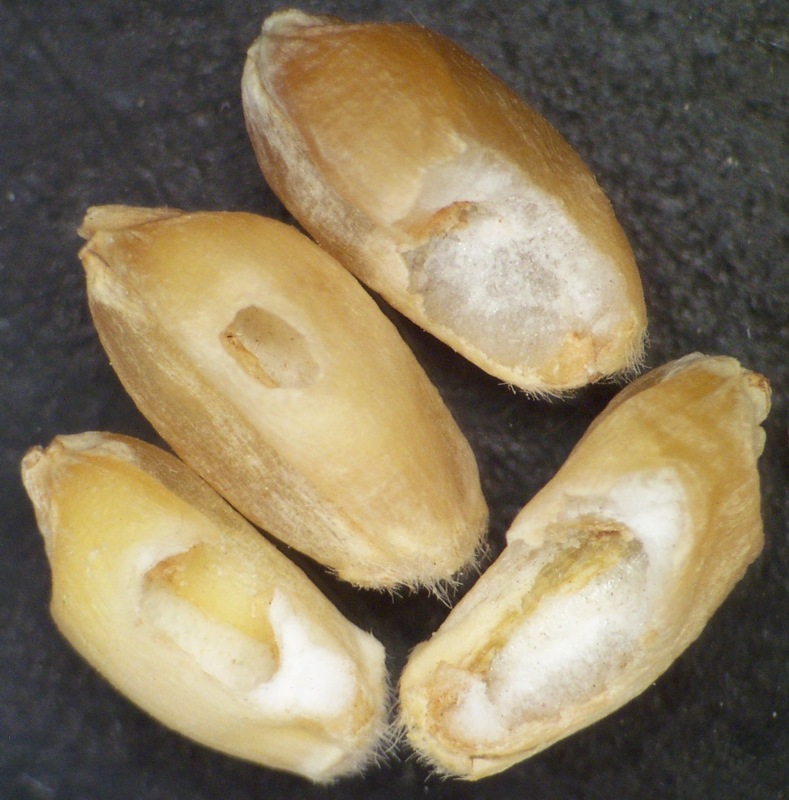 Grain elevators will dock wheat when samples contain 6-31 damaged kernels per 100 grams of seed. To coincide with the Food and Drug Administration’s defect action levels, the U.S. Standards for Wheat consider wheat containing 32 or more insect-damaged kernels per 100 grams as U.S. Sample Grade. This grain is unfit for human consumption and can only be sold as animal feed. 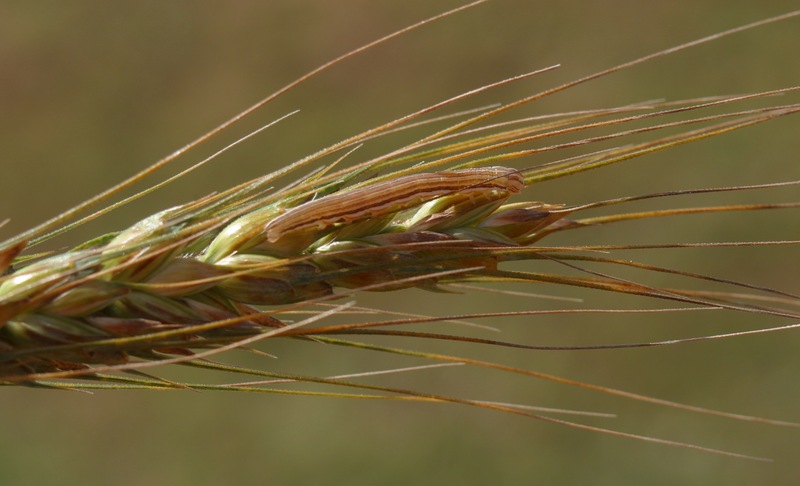 It is important to note that although the wheat is damaged, it is not an indication of an on-going infestation of grain weevil or some other stored grain insect pest. The best strategy to manage the problem at harvest is to combine wheat harvested from head rows with wheat harvested from the rest of the field to dilute IDK percentages. Treating a field with insecticide at harvest will be of little help because the damage is already done, most of the caterpillars have already pupated and remaining larvae can’t feed on the mature wheat grain. If a load is docked or rejected, check on insurance options. Most crop insurance policies have a Quality Loss Adjustment clause that covers the damage up to 25% of the crop’s value, regardless of the yield. Work with your elevator to collect and store samples of the wheat that can be used as evidence of the in-field damage. We have a late-maturing wheat crop that finally received some needed rain. I received a report of armyworms infesting wheat in the Vernon, Texas area. Armyworm infestations typically occur in late April through the first two weeks of May, but the cooler spring we are experiencing this year may have delayed their development. 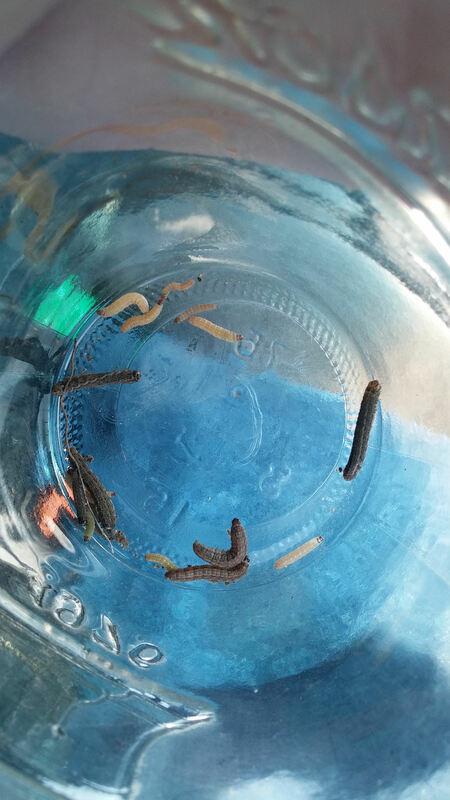 Armyworm infestations occur more frequently around waterways, areas of lush growth, or areas with lodged plants. These areas should be checked first to determine the size of the infestation. Early signs of an infestation include leaves with ragged margins that have been chewed. You may find “frass” i.e. 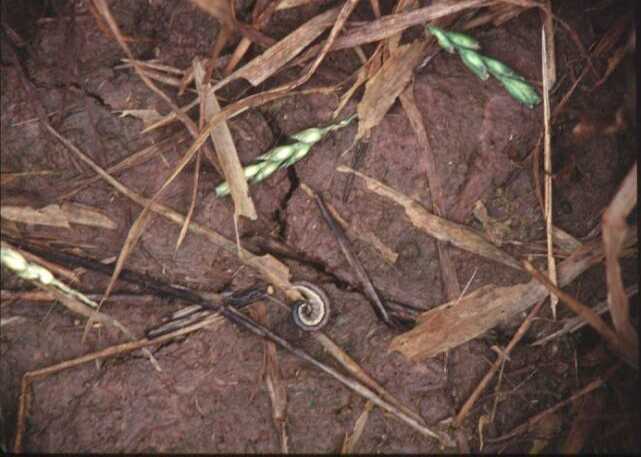 the excrement from armyworm caterpillars, around the base of wheat stems. They also tend to clip heads from developing wheat plants. The head clipping I have noticed over the years us usually restricted to secondary tillers with very small, green heads that would not likely contribute much to yield. Scout for armyworms, at 5 or more locations looking for “curled up worms”. Armyworm caterpillars tend to feed at night, so a good strategy is to bring a flashlight and look at fields after dusk when they are feeding up on the plant stems. The suggested treatment threshold for armyworms is 4-5 unparasitized caterpillars per linear foot of row. Armyworms have a number of natural enemies that help keep populations in check, if given a chance. In particular, parasitic wasps and flies attack them. If you find small white cocoons littered on the ground that are about ¾ the size of a cue tip, the natural enemies have already taken care of the problem. If wheat is past the soft dough stage, control is not warranted unless obvious head clipping can be seen and caterpillars are still present and feeding. Worms feeding on the awns when plants are past soft dough will not cause enough yield loss to justify the expense of an insecticide application that is solely intended for armyworm control. When choosing to spray, keep in mind that some insecticides require a 30 day waiting period for harvest. Consult CR-7194 Management of Insect and Mite Pests of Small Grains for information on insecticides registered for control of armyworms. I received several reports of treatable greenbug infestations in winter wheat in Major County. This means it is important to scout your fields for greenbugs. I encourage you to use the “Glance n’ Go system, as it is easy to use. The Glance ‘n Go system be accessed in two ways. One is to set up an account with the myFields platform: http://myFields.info and sign up for a personal account. This system will allow you to sample a field with a smart phone in the field. To use it, you must have cell phone connectivity. You can then select the Glance n’ Go tool, plug in your cost inputs, and start sampling. Once you sign up, you can scout multiple fields and myFields will keep track of all your sampling information. The second way is to access the Cereal Aphids Decision Support Tool on your computer http://entoplp.okstate.edu/gbweb/index3.htm . You can customize the threshold and selecting the Greenbug Calculator. Put your inputs in and it will select a threshold for your field. You can then download a paper Glance n’ Go form; take it to the field and start scouting. By answering a few simple questions, you can determine an economic threshold for controlling greenbugs. This threshold is based on the estimated cost of treating the field and the estimated price of wheat. Once a threshold is calculated, you can print a Glance ‘n Go scouting form, take it to a field and record your sampling results. The form will help you to decide if the field needs to be treatment for greenbugs. When scouting with the Glance ‘n Go system, keep a running count of tillers that have one or more aphid mummies and a running count of tillers that are infested with one or more greenbugs. The Glance ‘n Go form directs you to look at your total number of infested tillers and tillers with mummies after 5 stops. You will be directed to treat, not treat, or continue sampling. If there is enough parasitoid (mummy) activity, you will be directed to stop sampling and DON’T TREAT, even if you have exceeded the treatment threshold for greenbugs! Why? Because research showed that at that level of parasitism, almost all of the healthy-looking greenbugs have been “sentenced to death” and will be ghosts within 3-5 days. If they have received their “sentence” you can save the cost of an unnecessary insecticide application. I accessed the Glance n’ Go tool to determine a “general” threshold that you can use for a Spring infestation, based on a wheat price of $5.50 per bushel and an application cost of either $4, $6, and $8 per acre. You can go directly to the website and download a paper form (Greenbug Spring Infestation) directly. The threshold is 3 greenbugs per tiller if your application costs are $4 per acre or 2 greenbugs per tiller for application costs of $6 or $8 per acre. Contact your local County Extension Agricultural Educator for more information. If a field needs to be treated, check with Current Report CR-7194, “Management of Insect and Mite Pests in Small Grains”. 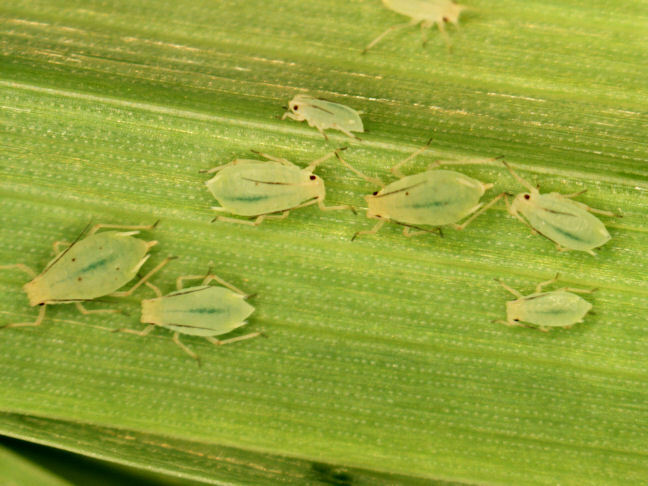 Crop consultants have reported greenbugs in a few northwestern Oklahoma wheat fields. The hit or miss nature of greenbugs and other aphid pests in wheat fields can make scouting challenging. Fortunately, there is an online tool called the Cereal Aphid Decision Support Tool that simplifies scouting for greenbugs and also considers the effects of natural predators. 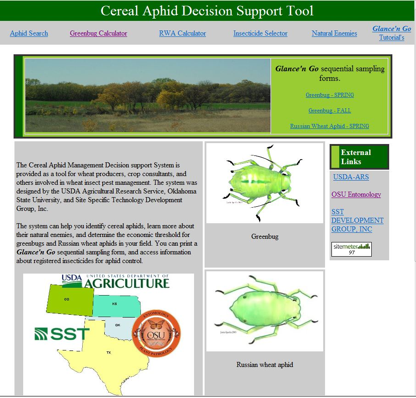 Start by going to the Cereal Aphids Decision Support Tool on your computer http://entoplp.okstate.edu/gbweb/index3.htm and selecting the Greenbug Calculator. By answering a few simple questions, you can determine an economic threshold for controlling greenbugs. This threshold is based on the estimated cost of treating the field and the estimated price of wheat. Once a threshold is calculated, you can print a Glance ‘n Go scouting form, take it to a field and record your sampling results. The form will help you to decide if the field needs to be treatment for greenbugs. There are several things that make Glance ‘n Go a good way to make such a decision. You only have to “Glance” at a tiller to see if it has greenbugs (no counting greenbug numbers). You can make a decision to treat “on the Go” because you stop sampling once a decision is reached (no set number of samples). Finally, you can account for the activity of the greenbug’s most important natural enemy, Lysiphlebus testaceipes. When scouting with the Glance ‘n Go system, keep a running count of tillers that have aphid mummies and a running count of tillers that are infested with one or more greenbugs. After each set of 5 stops, the Glance ‘n Go form directs you to look at your total number of infested tillers and tillers with mummies. If there is enough parasitoid (mummy) activity, you will be directed to stop sampling and DON’T TREAT, even if you have exceeded the treatment threshold for greenbugs! Why? Because research showed that at that level of parasitism, almost all of the healthy-looking greenbugs have been “sentenced to death” and will be ghosts within 3-5 days. If they have received their “sentence” you can save the cost of an unnecessary insecticide application. Treatment thresholds will probably fall around 2-4 greenbugs per tiller, but make sure you are using the Fall (Sept.-December) form, not the spring form. If a field needs to be treated, check with Current Report CR-7194, “Management of Insect and Mite Pests in Small Grains”. If you treat for greenbugs and have a failure, please contact our Department and we will investigate further to determine if insecticide resistance might be an issue. Dr. Ed Bynum, Extension Entomologist from Amarillo, reported finding some greenbug populations in 2013 that were shown to be resistant to chlorpyrifos, the active ingredient in Lorsban 4E, and other generic products (Govern 4E, Hatchet, Nufos, Vulcan, Warhawk, Whirlwind). The bottom line: he tested some suspect greenbug populations using a diagnostic test that he developed for testing greenbugs in sorghum in the 1990’s, and found that they were resistant to chlorpyrifos at labeled rates. Fall armyworm on the march! October 6, 2014 4:09 pm / 7 Comments on Fall armyworm on the march! Fall armyworms are active this fall. I checked a field of wheat this past weekend with significant damage from fall armyworms that averaged 6-7 fall armyworms per square foot. 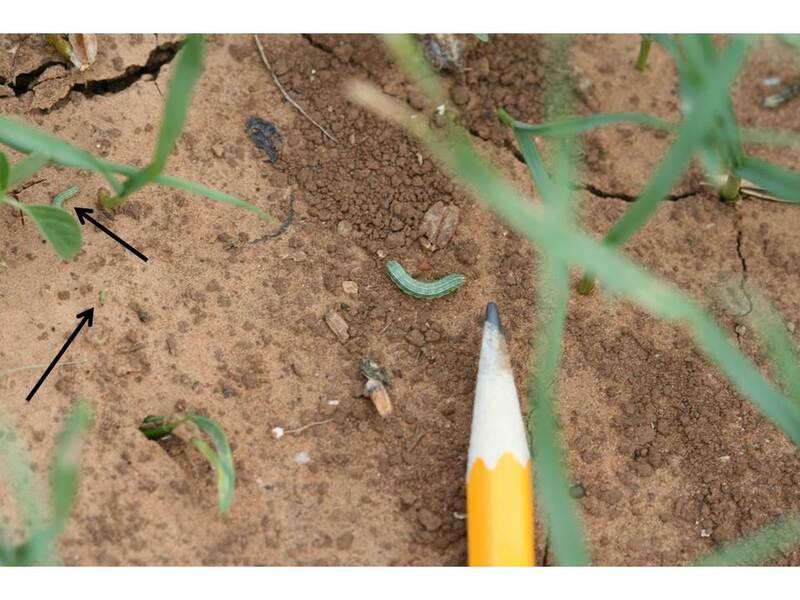 Scout for fall armyworms by examining plants in several (5 or more) locations in the field. Fall armyworms are most active in the morning or late afternoon. Look for “window paned” leaves and count all sizes of larvae. 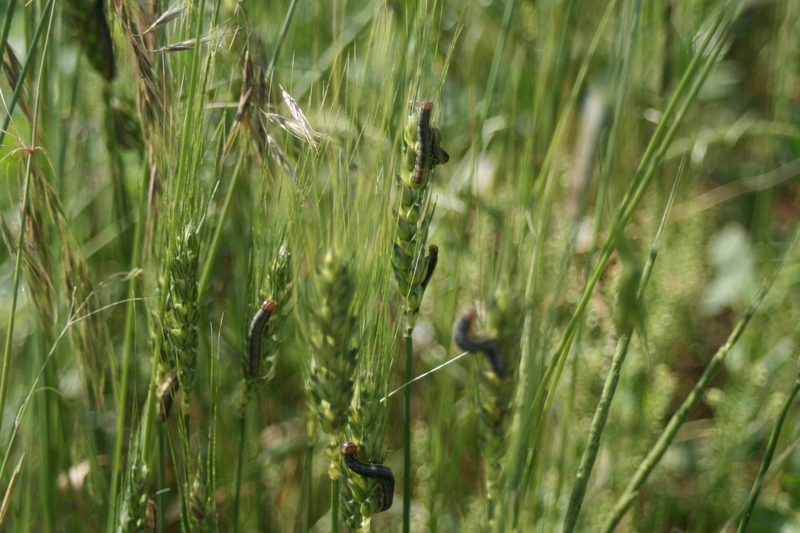 Fall armyworm damage is characterized by window panning on wheat leaves. Injury can sometimes be greater in field margins as armyworms sometimes move in from adjacent road ditches or weedy areas. 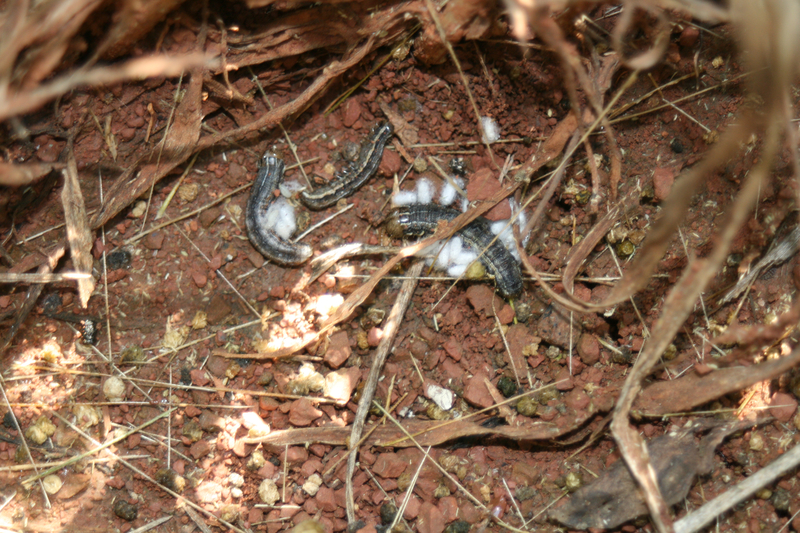 Fall armyworms are generally most active early in the morning or late in the evening. Spray when 2-3 armyworms per linear foot of row are present. Examine plants along the field margin as well as in the interior, because they sometimes move in from road ditches and weedy areas. The caterpillars were widely distributed in the field that I checked, suggesting that they were the result of a large egg lay from a recent adult moth flight. The suggested treatment threshold is 2-3 larvae per linear foot of row in wheat with active feeding. We won’t get relief from fall armyworms until we get a killing frost, since they do not overwinter in Oklahoma. Consult the newly updated OSU Fact Sheet CR-7194 Management of Insect and Mite Pests of Small Grains for control suggestions. 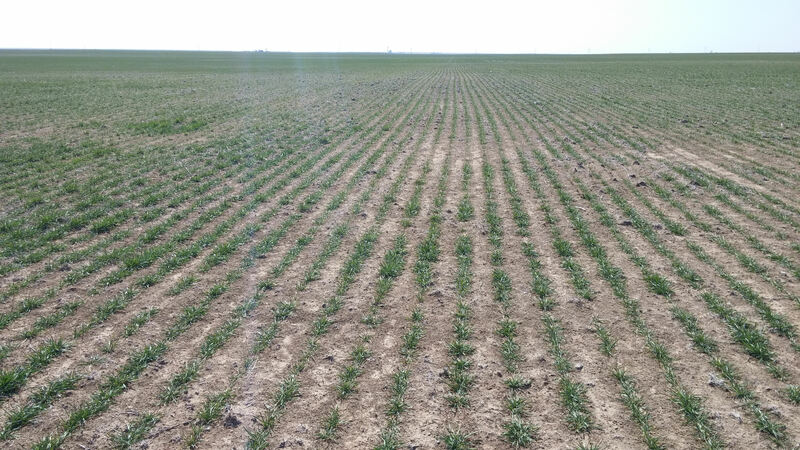 Our winter wheat has taken a beating this winter, with cold weather hanging on and some areas not getting that thirst quenching precipitation to help it get a great jump start this spring. In addition, I have received scattered reports of brown wheat mites showing up and causing problems. Producers need to remain alert so that their wheat is not suffering dual problems of dry growing conditions PLUS brown wheat mite. 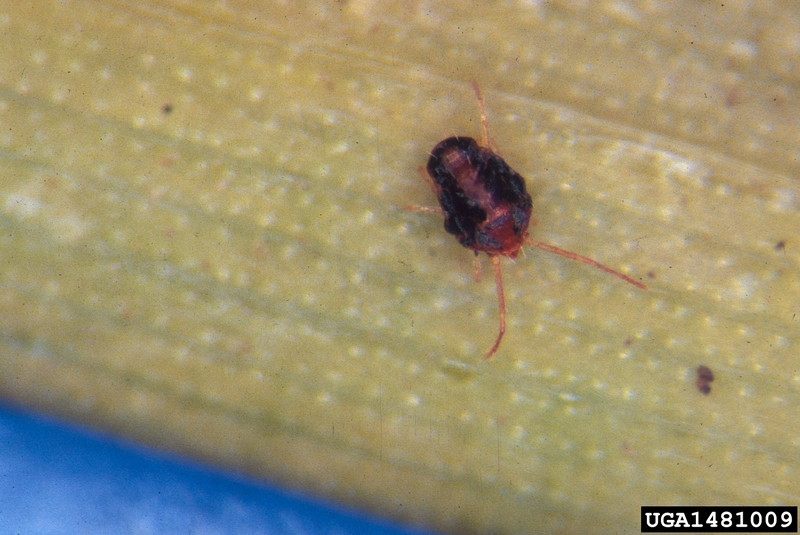 Brown wheat mite is small (about the size of this period.) with a metallic brown to black body and 4 pair of yellowish legs. The forelegs are distinctly longer that the other three pair. 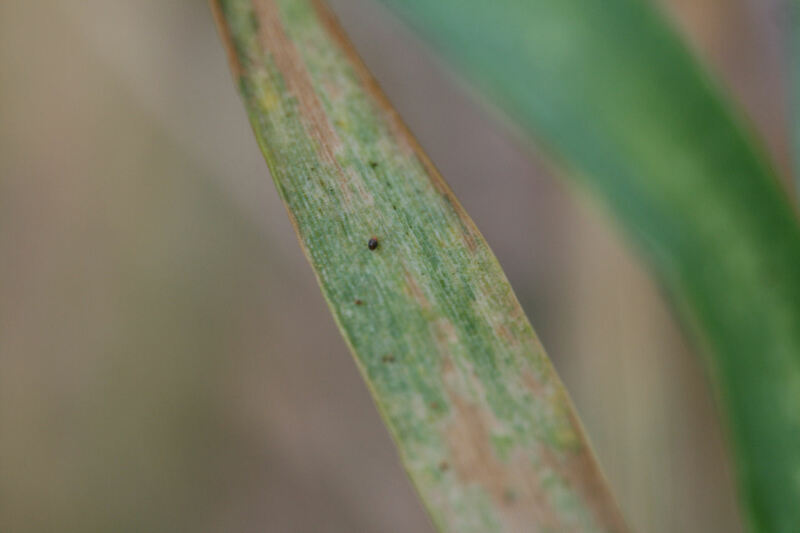 Brown wheat mites can complete a cycle in as little as 10-14 days. They will undergo up to 3 generations each year, but have probably already completed at least one or two by now. Numbers will likely decline if a hard, driving rain occurs. Spring populations begin to decline in mid-late April when females begin to lay “diapause” eggs. Research suggests that a treatment threshold of 25-50 brown wheat mites per leaf in wheat that is 6-9 inches tall is economically warranted. An alternative estimation is “several hundred” per foot of row. Check CR-7194, Management of Insect and Mite Pests in Small Grains for registered insecticides, application rates, and grazing/harvest waiting periods. 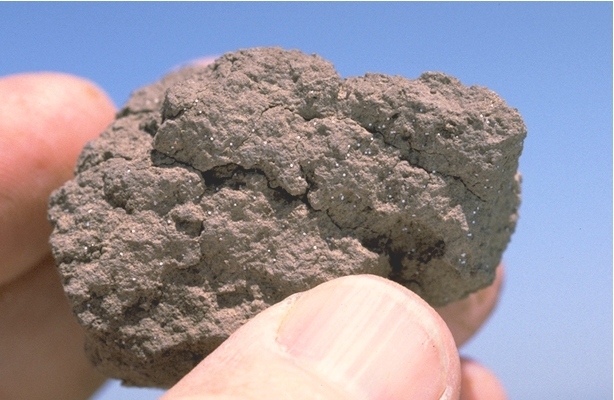 It can be obtained from any County Extension Office, at www.wheat.okstate.edu, or by clicking here. We have a late-maturing wheat crop that has fought its way through freezes, howling winds and it is now receiving some needed rain. This cool weather is also helping slow the maturity of the wheat. 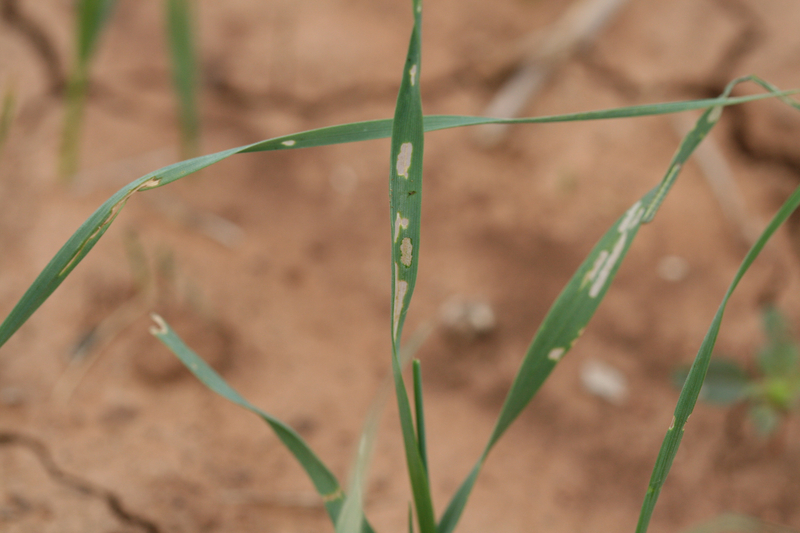 Right now, wheat is vulnerable to infestation from armyworms. Armyworm infestations typically occur in late April through the first two weeks of May, but obviously, the cooler spring we have experienced this year has delayed their development. I have noticed that there has been some fungicides being applied during the past few weeks. If an insecticide was added to that spray, it is likely to have reduced any armyworm population already established in the field. Still, it is important to check the field. 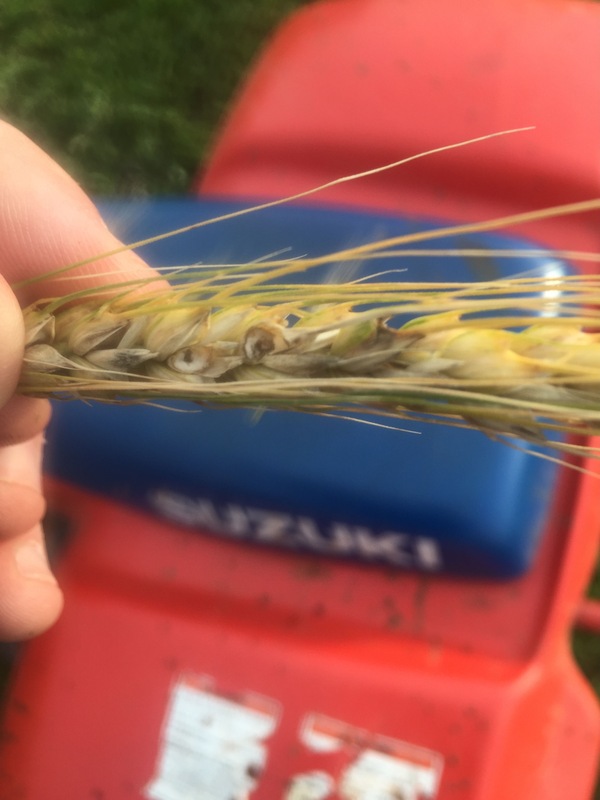 Generally if wheat is past the soft dough stage, control is not warranted unless obvious head clipping can be seen, and caterpillars are still present and feeding. Worms feeding on the awns when plants are past soft dough will not cause enough yield loss to justify the expense of an insecticide application. I received some troubling news from the Texas Panhandle. Dr. Ed Bynum, Extension Entomologist from Amarillo, reported finding some greenbug populations that were shown to be resistant to chlorpyrifos, the active ingredient in Lorsban 4E, and other generic products (Govern 4E, Hatchet, Nufos, Vulcan, Warhawk, Whirlwind). You can read the full article by clicking on this url: http://texashighplainsinsects.net/april-12th-special-edition/ The bottom line: he tested some suspect greenbug populations using a diagnostic test that he developed for testing greenbugs in sorghum in the 1990’s, and found that they were resistant to chlorpyrifos at labeled rates. This should not raise panic among growers in Oklahoma for two reasons. The first is that I have not heard of or received reports of any control failures for greenbugs in Oklahoma, in fact, generally greenbugs have been pretty scarce this winter. The second reason is that it is late enough in the growing season to expect that the primary natural control of greenbugs, a tiny wasp called Lysiphlebus testaceipes (see picture to right), keeping greenbug numbers from becoming an outbreak. The best course of action is to sample winter wheat fields with the Glance ‘n Go system.